1. Treasurer receives the first cheque. 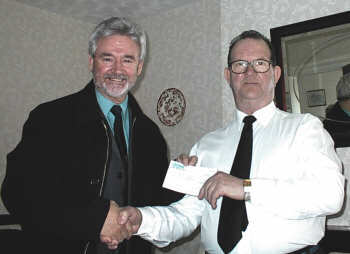 Treasurer, Ron Meir is pictured receiving a cheque of £13,000 as the first stage payment from the Heritage Lottery Fund from, SDVT Chairman, Ed Mason who is the Project Leader. The money is safe in Ron's hands. Perhaps too safe. Ron doesn't like us spending money if it can be avoided - a typical treasurer in fact. However, he has received fair warning that it will not be allowed to gather cob-webs but must be wisely spent for the purposes intended.